Think. Grow. Eat. : Diversity and abundance! 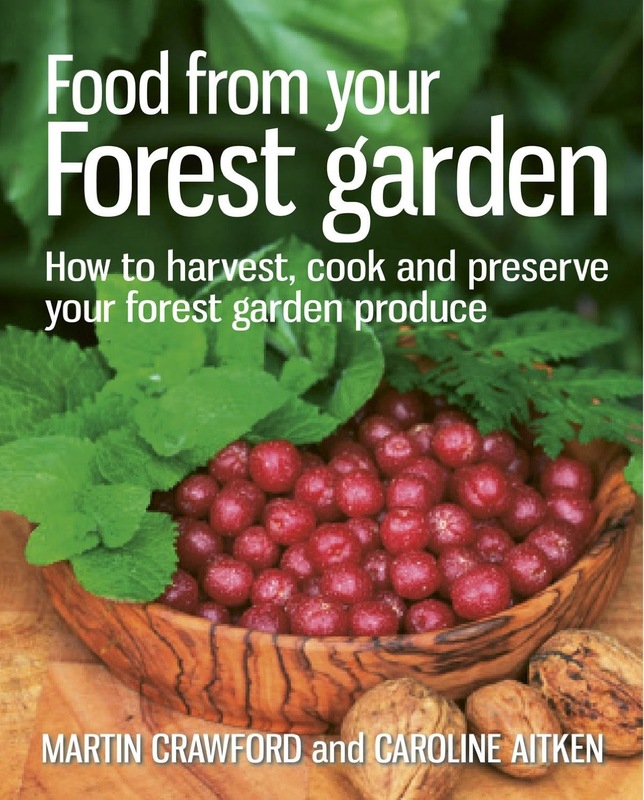 Following a disappointing growing season last year we decided we needed to get to the source of our problems and give our soil some extra attention. Having inherited 4 large brick raised beds with no soil in them (see previous posts) we set about filling them as quickly as we could so we could start growing lots of veg. 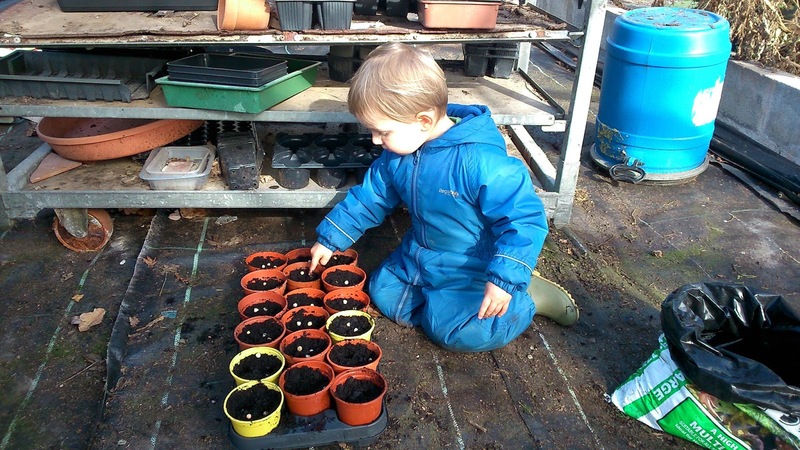 We used a mix of compost, leaf mould, spent potting compost and used peat-free grow bags. Plenty of organic matter, yes, but very little mineral content which meant that our veg was pretty weak and very vulnerable to attacks from predators like slugs, caterpillars, voles and birds. So, over the winter we dug down beneath the outer soil level of the first raised bed into a thick, solid band of yellow clay. With the help of some willing WWOOFers and some pick-axes we dug down a couple of feet and mixed the clay in to the soil we had made. 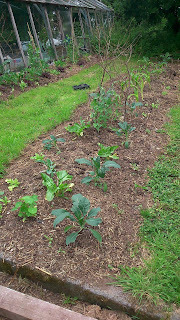 We expected the soil to take a couple of years to recover from being dug and mixed up so extensively.....however, this year we have had the most incredibly vibrant and healthy brassicas (broccoli, kale, sprouts, kohl rabi) bursting forth from the bed. 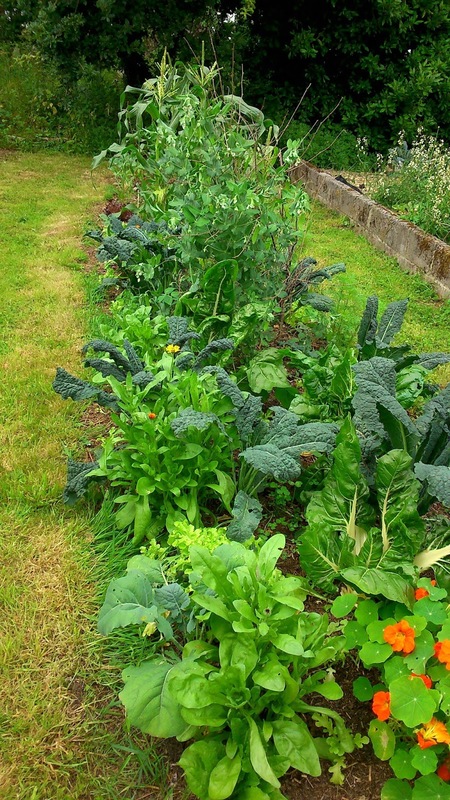 We've had all the same pests this year (although the slugs had a difficult spring so are less prolific) but the plants can handle the onslaught because they have everything they need to keep growing. Having said that we have had problems with voles eating the centres of the curly kale, so while it looks luscious and wonderful on the outside, there's nothing the middle. 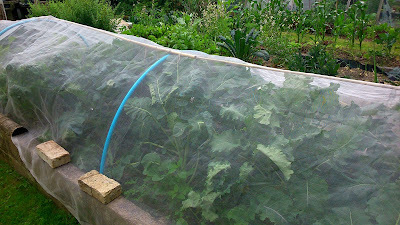 The voles love the safe protection of the Enviromesh which we use to protect the brassicas from caterpillars and pigeons (which works brilliantly), so I've been sprinkling the plants with hot chilli powder. I've used it in the past to deter cats from using beds as a toilet and it occurred to me that voles might be put off by it too. It really does seem to work, but of course after a few rain showers it needs to be redone. This is fine as I buy chilli powder in bulk very cheaply from a wholefoods wholesaler. 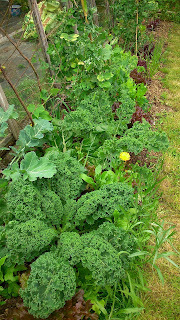 However, if I don't want spicy kale I have to be a bit more diligent when washing the leaves for cooking! As this seems to have been so successful we will do the same with the other 3 brick raised beds this coming winter. Anyone feel like brandishing a pick-axe in the name of soil fertility!? 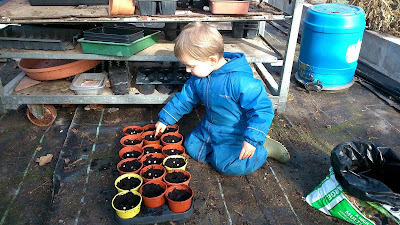 Hopefully having done this once to each bed we'll never need to dig them again. In contrast to this we created two new beds with a 3-layer organic mulch (see previous posts) which were planted up for the first time this summer. 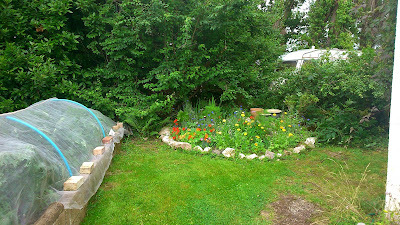 These 2 beds are now planted up with annual polycultures; the smaller bed has mange-tout, kale, chard, leeks, lettuce, cucumber, marigolds and cornflowers; the larger bed has mange-tout, french beans, kale, chard, sweetcorn, lettuce, beetroot, marigold, cosmos and nasturtium. 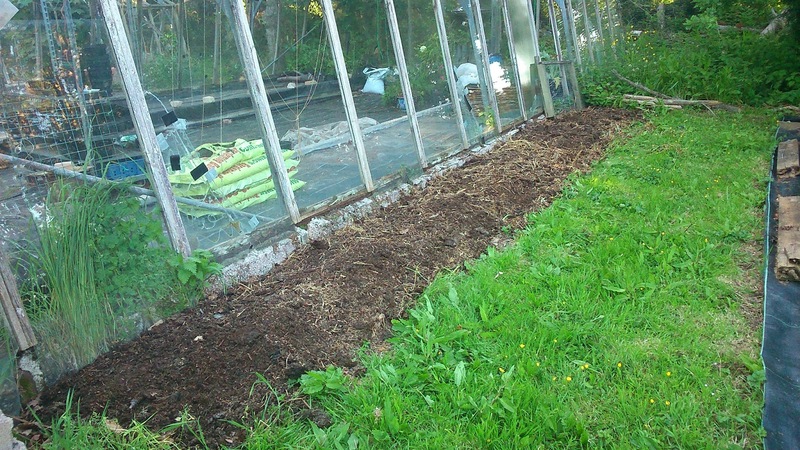 These beds used to be lawn grass with our lovely humus-rich clay loam beneath. We added a good layer of semi-rotted manure to the clearance mulch and it's no surprise that the crops are thriving. of the most satisfying things about growing food. The notable exception to this is late in the courgette season when, if you want to stay in someone's good books, the last thing you should do is turn up with an armful of marrows! Knowing this we ended up with a freezer full of marrow soup and a lot of marrow chutney last year....which we haven't quite finished yet. Fewer courgettes planted this year! 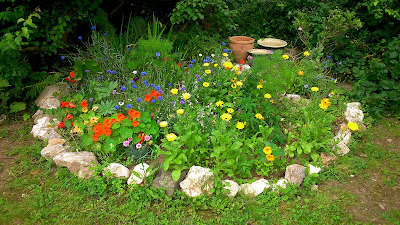 This summer has been a gardener's dream so far with plenty of sunshine and just enough rain to keep the soil moist and the water butts full. I have been loving the perennial flower and herb beds this year as they are now in their third or fourth year and everything is well established making the beds really full and colourful. 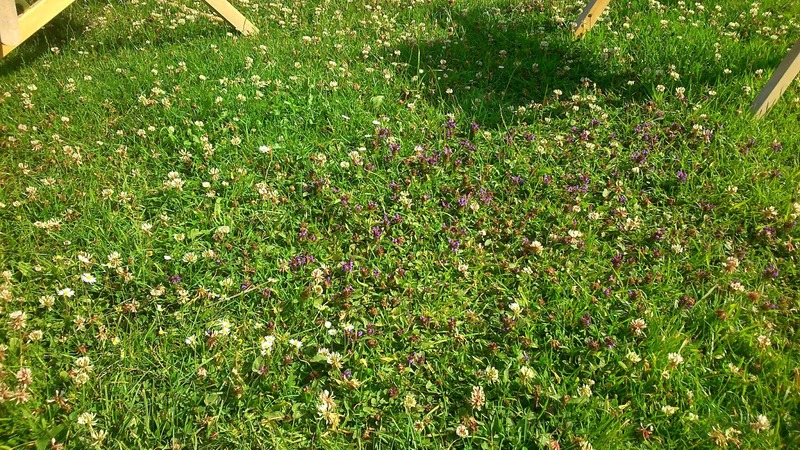 The lawn is buzzing with our foraging honey bees now as the white clover we've sown is flowering alongside the wild self-heal (Prunella vulgaris). It's great but we do need to tread carefully! 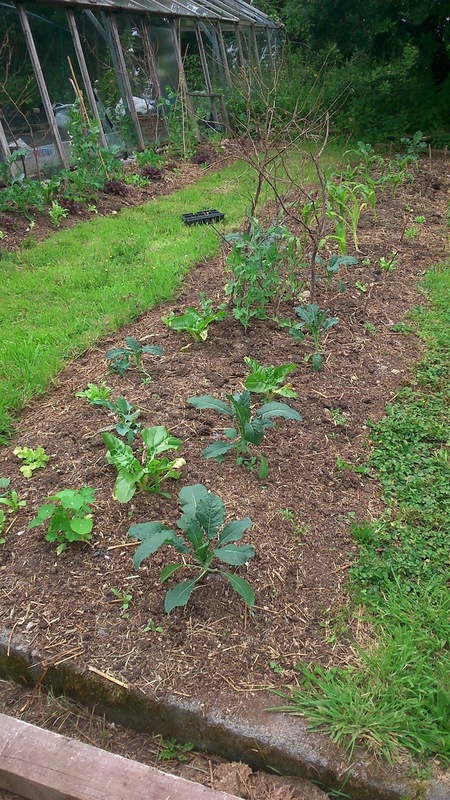 I also established a companion plant bed alongside the raised beds for flowers which will attract beneficial insects. Some flowers attract pests which would otherwise attack the veg crops, other attract predators of the pests, and other attract pollinators. Nasturtiums for example attract aphids which in turn attract ladybirds. Composite flowers like cosmos attract hoverflies which eat aphids and are also useful pollinators. Having these near to veg growing areas is an integrated pest management technique - making your 'system' more diverse and therefore more resilient. 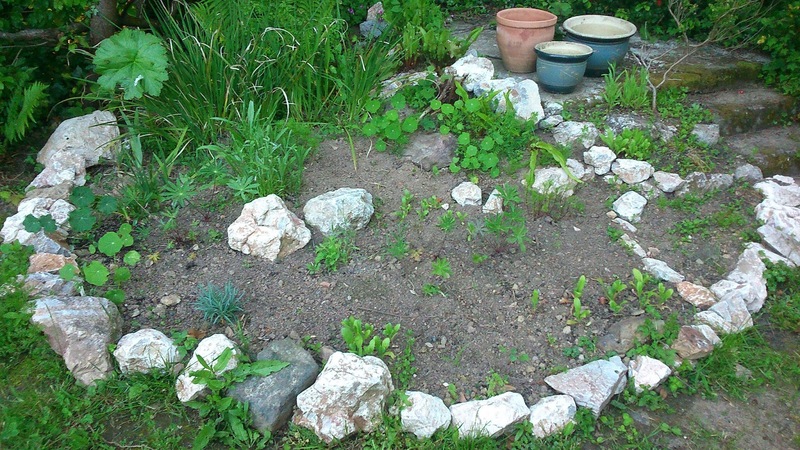 I began with a patchy area of grass and ivy which I dug over to remove roots. I edged the area with rocks left over from a neighbour's new stone wall, then I added a good layer of compost and planted it up with a variety of perennial flowers including nasturtiums, calendula, tagetes, poppies, cornflowers, cosmos, irises, lupins, star of bethlehem, violets, and various others which I had raised from seed or separated from clumps elsewhere in the garden. Another important function of this bed is to make me smile as I do the washing up, being right outside the kitchen window! So some plants were chosen just because I like them. 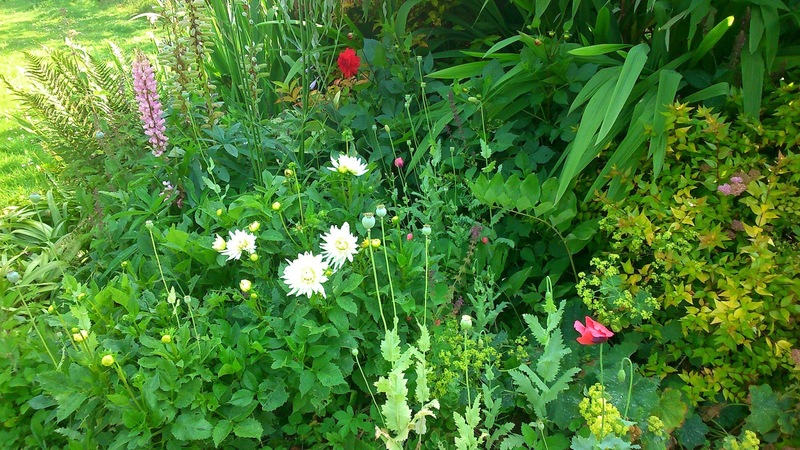 An amazing transformation from a shabby bit of lawn to a sea of colour. 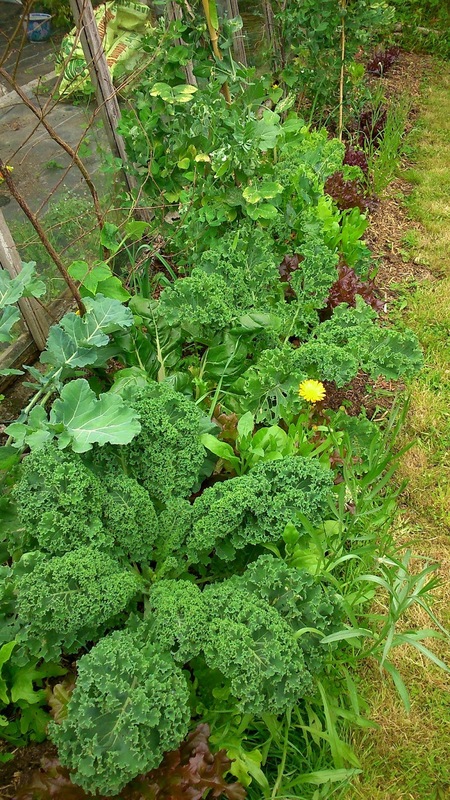 Next year it'll be even more helpful when we have a polyculture in the bed directly next to it rather than brassicas which are covered up, but I think the benefit will reach beyond the immediate surroundings.... and it's improving my washing-up experience greatly! Other flower beds are in full bloom now too. 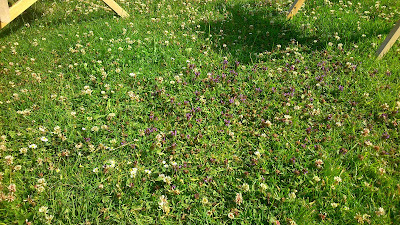 The buzzing lawn with white clover and self-heal.